These decadent coffee cakes make the perfect gift for any occasion. Send as part of your holiday gifts campaign, or any other time of the year. Perfect for welcoming a new client, thanking an employee or marketing a new product. Blueberry Crumb, Cinnamon Walnut, or Chocolate Chip. 1 week when unopened. Can be frozen for 3 months. 3 Days (plus transit time). Fill out the form below and one of our Gift Experts will get right back to you with an estimate. Need 25 or less? Click the ORDER NOW tab above to place your order today. Exclusively ours! Our two pound coffee cakes are moist and sweet. We have just the right mixture of all the highest quality ingredients. Fresh eggs and silky sour cream give this cake its unbelievable moistness. 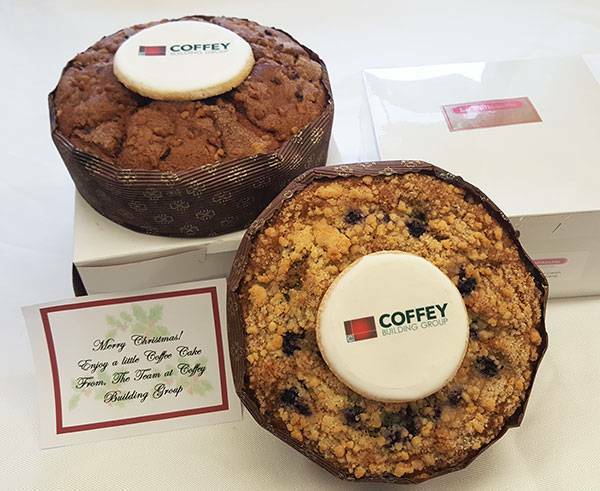 We top each coffee cake with your personal logo or artwork, making our logo coffee cakes a truly unique way to market your brand.